Be twice as efficient with the easily connectable desktop attachment. Just snap it on and keep on going. Reclaim your living space with this ProForm® bike that folds in seconds. 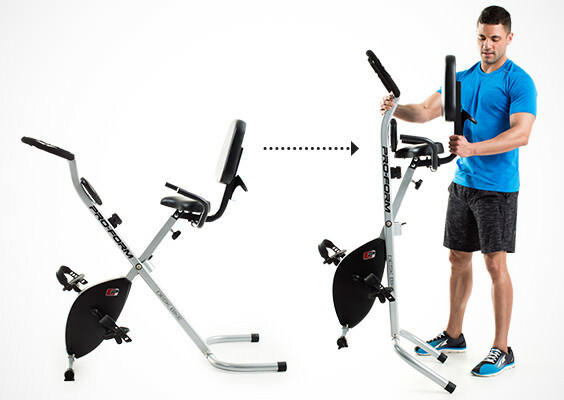 In one easy step, the Desk Bike folds up and out of the way. Many exercise bikes are loud and clunky while pedaling. This smooth, quiet resistance system uses high-tech magnets allowing you to adjust your workout intensity without interrupting your workout. 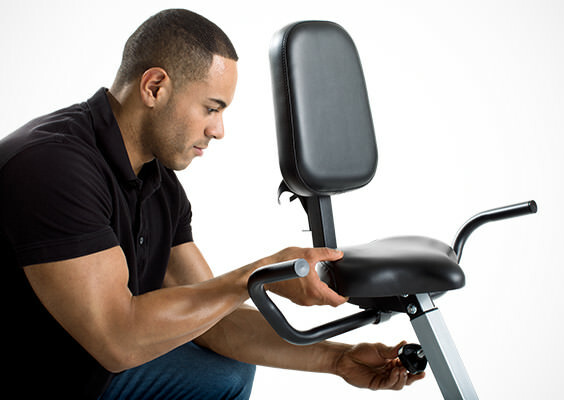 Exercise in luxury with this oversized, padded seat. Adjust it vertically to find the perfect fit. Heart rate sensors built into the handlebars help you monitor your heart rate throughout your workout. You’ll stay on track for your goal-specific results. Improve muscle tone when you adjust the bike’s resistance. Choose from eight resistance levels to enhance any workout. Designed to keep your feet in place, these pedals are built with adjustable toe straps to increase stability. Stay hydrated throughout your workout by keeping your water bottle close. This convenient water bottle holder is built-in to the back of the seat so you don’t have to go far to quench your thirst. Easily move your bike around the room with the built-in transport wheels. 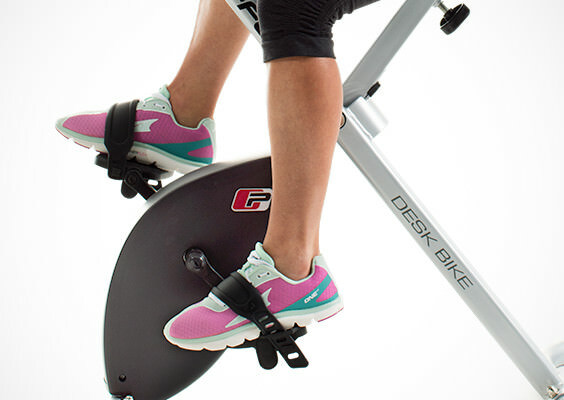 The Desk Bike is protected with a 1-Year Frame Warranty and 90-Day Parts & Labor Warranty.